So, there we go. The World Cup is on. England are a very good team and they can go to Japan full of hope and expectation. God help them. These things are always better when they sneak up on you. This is going to be a long, expectant nine months. Was the game against France a better display than that against Ireland? Not even close. But it didn’t need to be. Ruthlessness isn’t necessary on an animal so intent on defeating itself. France aren’t a bad side, but a side with a bad attitude, bad strategies and a complete lack of belief. At times, they cantered alongside England, happily playing the part of the losing team. France were out of position, out of kilter, out of ideas. “They had an excellent kicking game,” said chief Brunel after the match, as if surprised by a fact so alarmingly put forward last weekend. Chief Wiggum would have set his team up with more idea on how to cope with England. And he plays Ned Flanders at fullback. England defeated France with variety. Either side of each breakdown, there were always choices. If not Vunipola, it was Sinckler; if not Kruis, Lawes; if not Farrell, Slade; if Daly didn’t nudge the ball through, Ashton did. Jonny May was the sharpest sword on the field but crucially, everyone knew how to use him. If Wales are to beat this England side, they have to cover off a multitude of angles. In the run-up to Cardiff on the 23rd February, Eddie Jones and Warren Gatland will engage in a bizarre game of ‘No, you’re the best’, like a pair of smitten teenagers trying to put down the phone. Wales may be on a record unbeaten run, but they have shown none of the ingenuity and skill their visitors have this Six Nations. England are favourites for the Grand Slam. Love it or loathe it. England’s most recent performances conjure up some interesting talking points. In many ways, the last two matches have answered questions. The debate as to whether Manu Tuilagi will be as good at inside centre seems to have been quelled. Elliot Daly’s positional argument appears also to have been settled at fullback. Farrell’s move to fly-half has also met with near universal agreement. But for all the positives, there has to be negatives. For certain stories to unfold, others will need ending. Do Mike Brown, James Haskell or Chris Robshaw ever play for England again? There was talk of one last Japanese hurrah. Maybe the former will travel East later this year but the other two? I don’t know where they were watching Mark Wilson do his stuff these last two weekends, but I can’t imagine there was too much joy. Like seeing your ex- with a new man: in a way, you’re happy; he will treat her well, protect her, make her smile. But it could have been you. Haskell and Robshaw will no doubt send Valentine’s cards, despite their love being unrequited. England, it seems, have moved on. Staying in the back row: has Tom Curry done enough? Sam Underhill is one of a few men who could still make a case for inclusion, such was his form in the Autumn Internationals. And if T Curry looks like a man who can, why not B Curry? They are identical in looks and playing ability. Why not take both? And what of Sam Simmonds? A very different prospect to Vunipola and Hughes at No.8; he’s not very far away from returning to the Exeter team. With an explosive end of the season, does he not get the nod again? In the second row, a different sort of problem. How do you get Kruis, Itoje, Launchbury and Lawes all into the same side? Which is the best combination? The front row looks relatively settled with only one question looming. Does Dylan Hartley get back into this side? He will have to play well to do so. What of Jonathan Joseph, Alex Lozowski, Anthony Watson? Three men with designs on a World Cup but in being injured or out of favour, the bus they want to get on has seemingly left without them. Is Ashton a better footballing option than Cokanasiga? The Sale winger didn’t really take his chances against the French. His position in the back three could be most precarious, especially with how Jones views Jack Nowell. So for all the answers, there are still fascinating questions. There is so much to admire in Eddie Jones’ England and if this is the conception of a World Cup baby, congratulations are due. 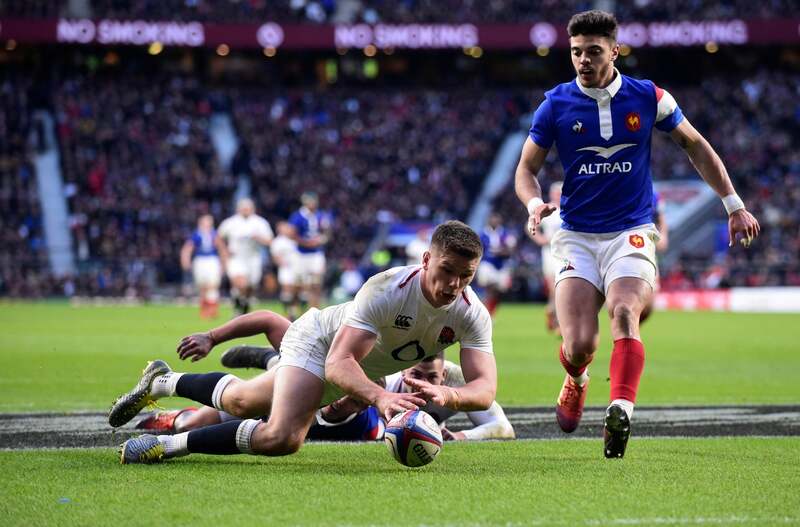 But in truth, there is still a long way to go: three remaining Six Nations games, an uncompromising end to the Premiership campaign, Saracens’ run in Europe. Heads, shoulders, knees and toes will have to stay intact. Like all good journeys, there remains the risk they might not get there. But that is what makes the destination so much sweeter. Make no mistake, England’s World Cup is most definitely on. This entry was posted in rugby, Sport and tagged eddie jones, england, england rugby, france rugby, guinness six nations, Japan, Rugby World Cup 2019, six nations. Bookmark the permalink.